I like to make a video with a bunch of images and an underlying music track. Now I would like to sync the length of the images to the beat of the music. 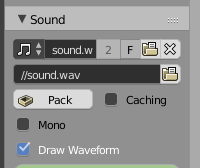 I know that there is a Bake Sound to F-Curve, but I have no idea how to use the data of that f-curve to an array of clips and influence the length of those clips. I tried google search, but didn't found any solution for my problem. Maybe anyone has done something similar or has an idea. Thank you! Not the answer you're looking for? Browse other questions tagged video-sequence-editor audio . How can a f-curve be used in an animation in BGE? VSE: rendering highest quality audio settings and process?